I made a spinner card years ago but I hadn't tried the tilt card. I then got this idea to making a little dancing party owl. When you shake the card, he does a little shimmy (he's in the classic Saturday Night Fever pose)! It's pretty cute. Go to the SCS Tutorial to find out how to make a basic tilt card. 1) Punch 7 modern labels in close to cocoa cardstock. Trim 2 of the labels to narrow one end. One of the labels is rounded out at the bottom and another small piece of cocoa is cut off to create a small branch. Sponge the edges of all pieces with chocolate chip ink. Layer 3 labels for the widest part of the branch. Layer 2 and glue onto the end and glue one label on the end of the branch. Attach the smaller branch with a dimensional. 2) Punch 2 scallop circles in certainly celery, wild wasabi and garden green textured cardstocks. Sponge the edges of all pieces with wild wasabi ink. Glue onto branches. Attach the top layers with dimensionals. 3) For the owl, punch the body in basic gray, belly in going gray, feet and beak out of pumpkin pie. Punch 2 basic gray wings with the 2 step bird punch. Sponge the edges of the basic gray pieces with white craft ink. 4) For the hat, punch 1/4 of the 1 3/8" circle. Then line up the same circle over the top of the small semi circle and punch out the circle. It will look like a circle with a small piece punched out of one side. Fold in the sides to create the hat. Punch the pompom on the hat with the boho blossom punch. 5) for the party horn, punch the small vertical slot punch and glue that piece onto the end of a modern label. Clip away the sides to create the horn. 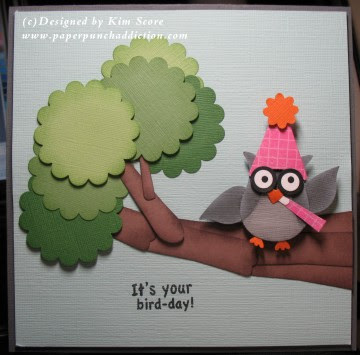 The greeting is from My Pink Stamper in a set called Punnylicious. how adorable in this...and Yay!!! finally we will be getting the rest of the punches I need in our new catalogue (aussie) next month...I will be back to buy more tutorials now ! What a hoot, Kim! Great BD card!